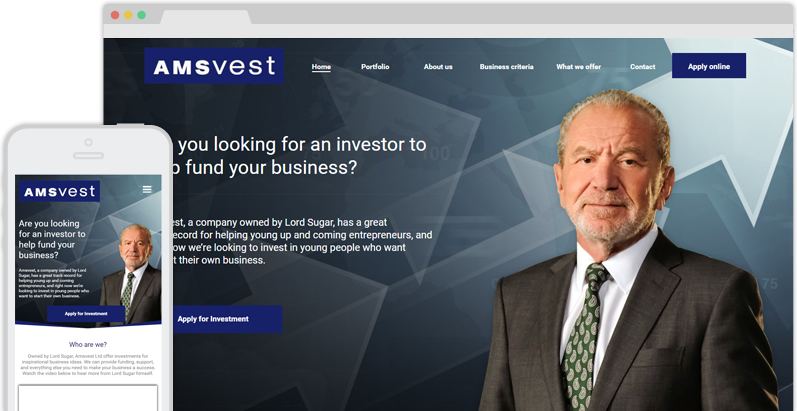 British business magnate Lord Sugar wanted a website that would allow business owners to submit pitches to Amsvest, his privately-owned investment vehicle. We at Designer Websites had already impressed Lord Sugar and his team on a number of previous projects, and so we were asked to deliver a website that would reflect Amsvest’s prestige and professionalism while also making it easy for entrepreneurs to apply for funding. Designer Websites created www.amsvest.co.uk a highly professional website that does a great job of encapsulating Lord Sugar’s well-established reputation for business expertise. Our designers and developers worked together to produce a great-looking site that’s easy to use and totally fit for purpose. "Designer Websites did a great job for us in putting together our website. Not only were they professional in delivering what they promised, they also did it in a timely manner that allowed us to successfully launch our new Amsvest website." Investment Website Design for Lord SugarWhile Lord Sugar has long been a prominent member of the UK business community, he is perhaps best known for BBC One’s The Apprentice, where aspiring entrepreneurs compete to become his latest business partner. The Designer Websites team have created websites for a number of former Apprentice winners in recent years (including Ricky Martin, Dr Leah Totton, Joseph Valente, Alana Spencer and Sarah Lynn), so Lord Sugar was already well aware of our capabilities. 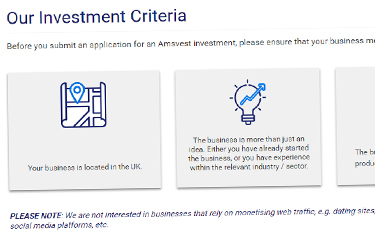 The Amsvest website was conceived as a means of receiving investment applications from business owners outside of The Apprentice’s reality TV framework – anybody can now submit a pitch to Lord Sugar and his team! Investment CriteriaOne of the most important requirements of this project was to make Lord Sugar’s criteria clear to potential applicants. In order to ensure that the Amsvest team wouldn’t be swamped by hundreds of unsuitable submissions, our design team worked hard to make the key requirements (as well as the benefits of an Amsvest investment) as clear and as easy-to-digest as possible. Submitting an ApplicationThe Amsvest website makes it supremely easy to submit an investment application to Lord Sugar and his team. 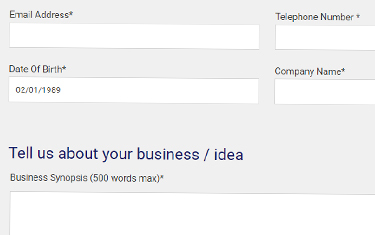 Business owners looking to make a pitch have only to fill out a single form and click ‘submit’. However, we made sure to balance this simplicity with minimum required wordcounts in the 'Business Synopsis' and 'Your Experience' fields to prevent low-quality submissions. 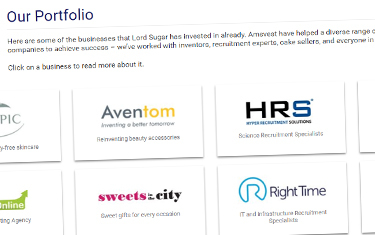 Company ProfilesWe also created a ‘Portfolio’ page that allows Amsvest applicants to read about some of Lord Sugar’s other business partners (including companies founded by Apprentice winners such as Hyper Recruitment Solutions and Sweets in the City). This section is easy to navigate and includes some fantastic examples of the kind of success that an investment from Lord Sugar can bring.